Cereal milk desserts aren’t anything new, but they’re still something to get excited about. While New Yorkers are lucky enough to have Momofuku Milk Bar’s luscious cornflake milk-infused soft serve at their disposal, such treats just aren’t that common in L.A (though we hear SweetXO in Agoura Hills has some great cereal ice creams). Instead, we have to make do with toppings of Fruity Pebbles and Cap’n Crunch on our frozen yogurt whenever we crave that sort of nostalgic flavor. 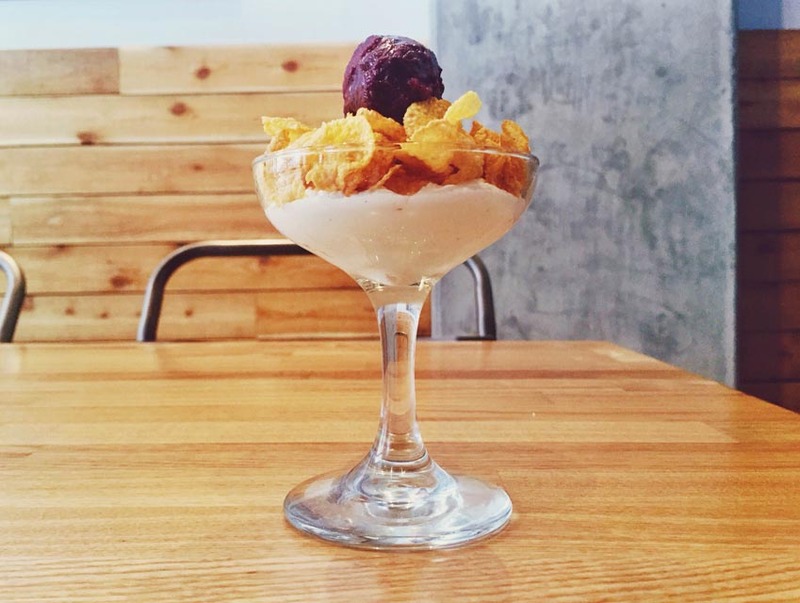 Plan Check’s executive chef Ernesto Uchimura must have felt the same way because he’s just introduced two new cereal milk desserts in the form of a parfait and doughnut. Both include whipped cereal milk cream—the parfait is layered with the creamy stuff along with cornflake granola and a small scoop of blackberry sorbet, and the doughnut is glazed in cereal milk and encrusted with Crunch Berry cereal or Corn Flakes. To make the milk cream, Corn Flakes are soaked in cold milk for a half an hour and then strained. Afterwards, the milk is sweetened more with powdered sugar and punched up with vanilla bean. For the doughnut glaze, the same ingredients are cooked over low heat and drizzled on. “I am inspired by the comforting memories of eating cereal while watching cartoons as a child and wanted to revisit those moments as a grown up by creating adult versions of those flavors,” says Uchimura. Is it bad form to bring a Scooby Doo-loaded device to a restaurant? Plan Check has three locations. Check out their website to find one closest to you.